Whitening Simulator, developed by CanaryCreations, is a super easy to use teeth whitening simulator. 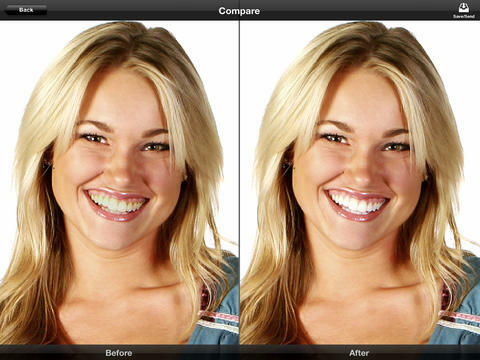 Now you can see what you would look like with whiter teeth in just seconds. This Whitening Simulator is extremely easy to use and can make your pictures a whole lot nice when you have those pearly whites showing. Simply snap a picture with your iPhone, iPad, or iPod touch, or choose a picture from your photo library. Next, the whitening simulator will use it’s advance detection system and search for your smile to automatically whiten your teeth. If for some reason the program cannot detect your smile, you can enter manual mode and it guides you through the process. Once you are all set you can move the slider at the bottom to whiten your teeth and fine tune the color. You can rotate the device to zoom directly into the smile to fine tune even more. Lastly, you can tap compare to quickly compare your original smile compared to your simulated smile. Once you are all set and satisfied with the results you can quickly save the picture directly to your camera roll or share it via Facebook, Twitter, Mail, or Message. The application also includes a whitening glossary, in case you want to learn more about all of the most commonly used terms. The only downfall of the application is that you can only whiten one smile at a time, so if you want to whiten multiple smiles in a photo you will have to save and reopen the same picture. Not that big of deal but it would have been nice to whiten multiple smiles. Whitening Simulator is currently a FREE application on the Apple AppStore. Go check it out and start simulating your smile today!